The Columbus Park of Roses is 13 acres of rose beds, daffodils and herbs along with other assorted perennials within the garden setting. 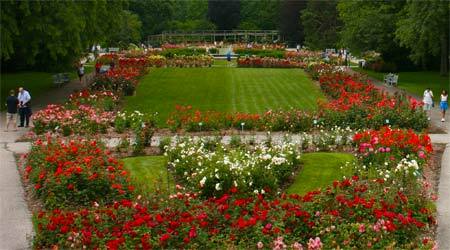 The Park of Roses is one of the largest municipal rose gardens in the United States. Wide paths afford comfortable walking and viewing. All roses in the garden have been labeled by name and classification. 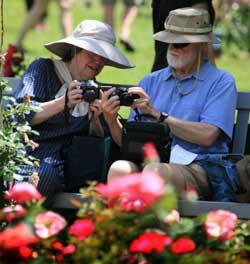 The peak viewing time for the rose beds is around mid June and again in mid September. 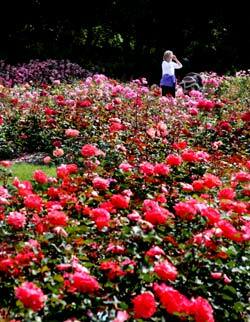 There are more than 11,000 rose bushes in the garden and over 350 different varieties of roses. Construction of the park began in 1952. While the area had a topsoil depth of 11" — 15" of sandy loam, all of the flower beds were excavated to a depth of 2'. Existing soil was removed and mixed with imported peat moss and fertilizer and then return to the beds. Over 21000 bales of peat moss were used in this process. Formal opening of the park was in June 1953. In January 1954 the American Rose Society Headquarters relocated from Hershy Pennsylvania to Columbus and remained there until 1974 when it was moved to Shreveport, Louisiana. 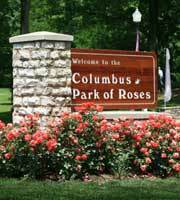 The Columbus Park of Roses is one of just 133 public gardens approved by the All-America Rose Selections, Inc (AARS). All AARS public gardens meet strict requirements to receive this certification. 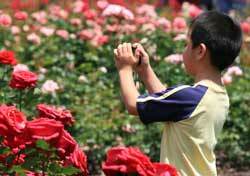 Each year on the second weekend of June, the Park of Roses puts on the Rose Festival. It is during this weekend that most of the roses are in top form and visitors from all over the country descend on Whetstone Park to view the thousands of blooms. Entertainers throughout the park provide a constant stream of music that blends beautifully with the sea of blooms. If you want to take home a few roses, bring your camera. A new demonstration garden was added to the massive rose garden. In 2007, the first phase was installed and then expanded in 2009 that features roses that are being evaluated by the Agricultural Department of Texas A&M University to be environmentally responsible in that are grown using no fertilization, either organic or inorganic, they receive no pesticides, fungicides, using limited irrigation practices along with minimal protection and pruning. The Earth-Kind Rose Garden, like the Heritage Garden, blooms earlier in the year with peak blooms in late April to early May depending on the weather patterns for that particular year. 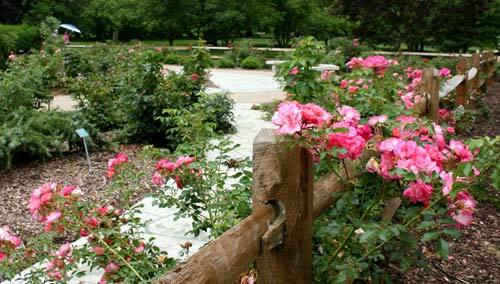 The Park of Roses is part of Whetstone Metro Park and is located on the west side of High Street, just north of North Broadway. Admission and parking is free. Open year round from dawn to dusk. All areas are wheelchair accessible. Best times for seeing the roses in bloom is in early June.